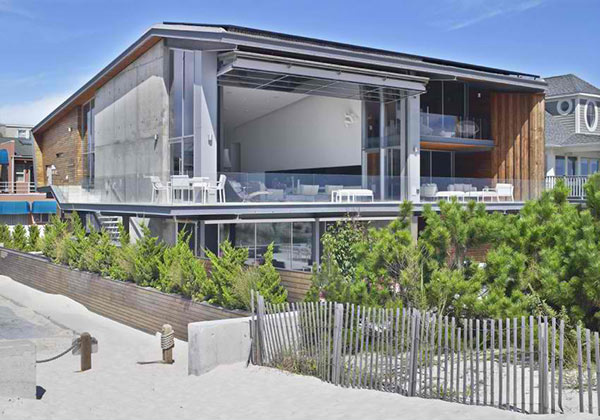 The Sea project is a beach house located in Long Beach, New York, USA which lies on a 60’ wide x 100’ deep corner lot on the Atlantic Ocean. 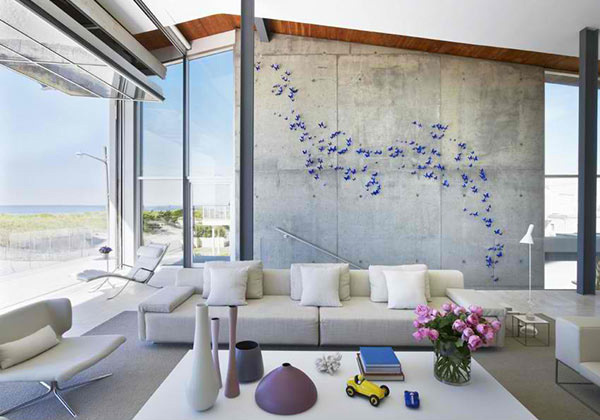 The design of the house is indeed beautiful especially that is located near the beach. 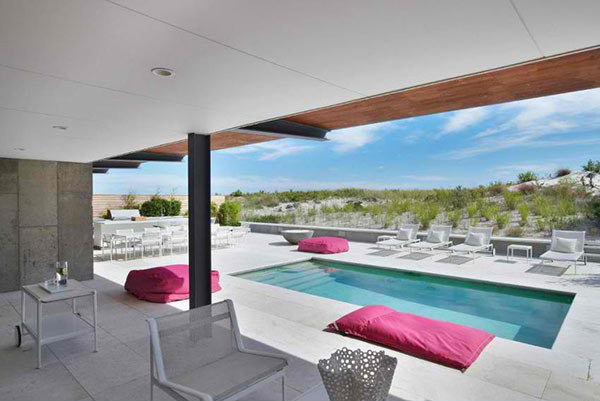 The views around it is a bonus to the house considering its appealing interior and exterior. 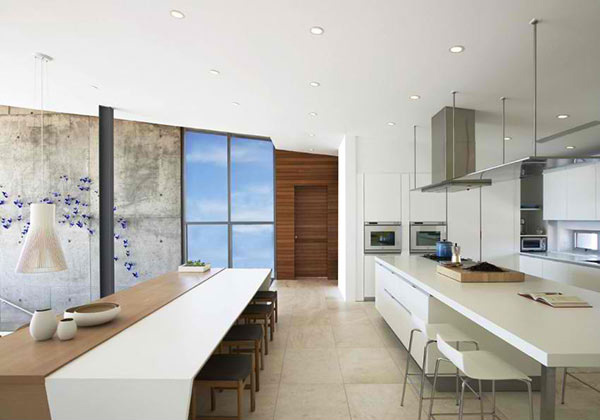 This design by West Chin Architects is an award winning project for a 5,500 square foot home that takes advantage of unobstructed views of Long Beach and the ocean. 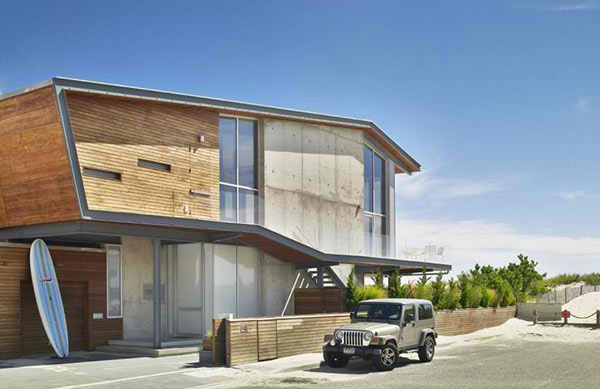 “This is the first house in the United States to use the environmentally conscious structurally dynamic BBS wood structural panels from Austria. These panels allow a minimal floor slab thickness and large spans, and in the same breadth provides insulation value. The BBS acts as the interior and / or exterior finishes in many cases; this was a warm balance to the vast amount of glass on the façade and the exposed reinforced thermal concrete wall. At the top of the interior stair one will find the 26’ wide bi-fold garage door that opens up to an unobstructed view of the ocean, beaches and horizon. 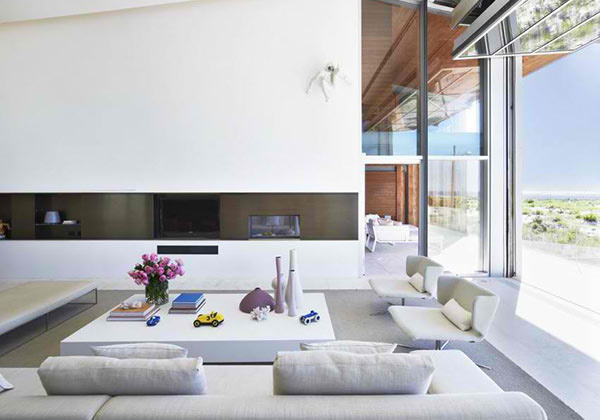 Every element of this beach home takes advantage of its natural surroundings,” the designers defined. Well, there is really more interesting features for the house which can be best shown through the images below. There is something really interesting with the look of the house which is mirrored in its facade. Open areas and terraces surround it allowing people to maximize the views and the breeze from the beach. A tall glass paneled wall is used for the second and third levels. You can also see that the terraces have glass railings. 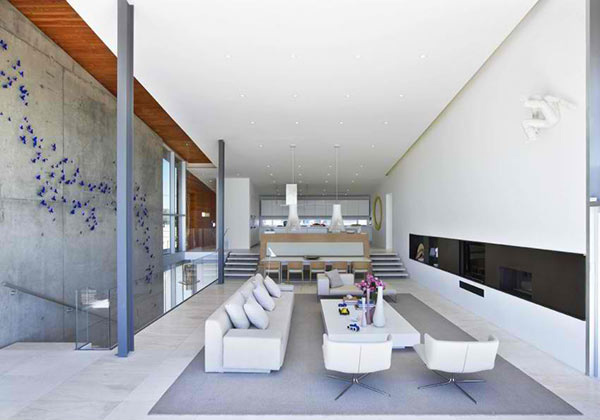 An appealing yet relaxing living room with white as its primary color. 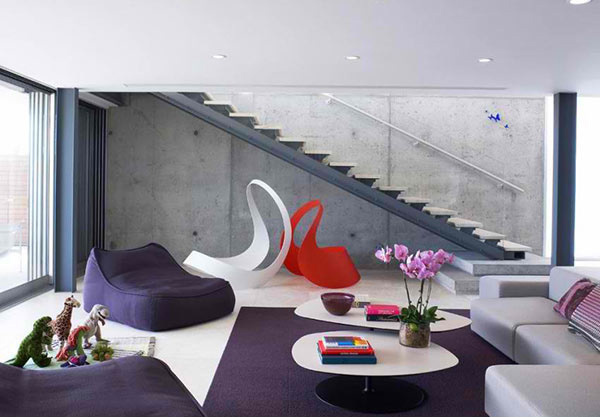 The living room is located on the second floor of the house where you can see a concrete wall on the staircase area. Yes, this minimal and modern living area is lovely but the blue thingy on the wall will also draw your eyes as well as your interest. The kitchen and dining area is just beside each other making it easier to provide food. We like the industrial feel of the house while keeping its modern vibe. 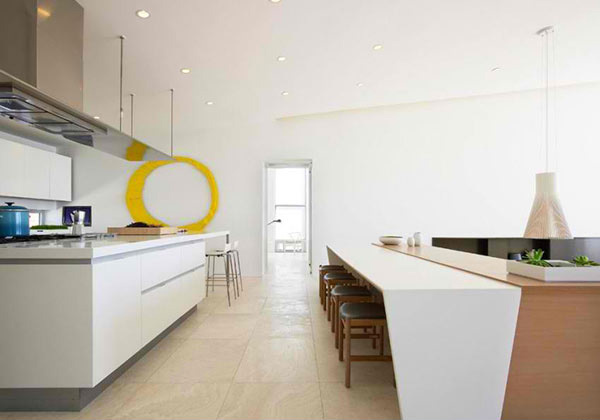 Another look at the dining-kitchen area with a circular yellow wall decor on one side. The dining table has a unique design that looks a bit intriguing! The blue thingy on the wall? Butterflies! No, they aren’t real ones. These are handmade butterflies which can also be bought ready made from stores. 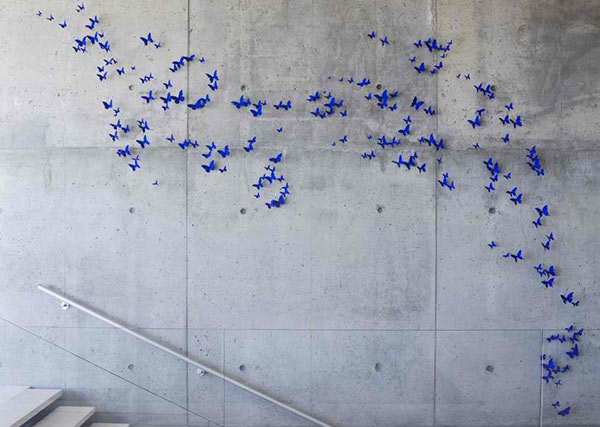 The manner of arrangement for the butterflies is really creative especially that leads to the window. 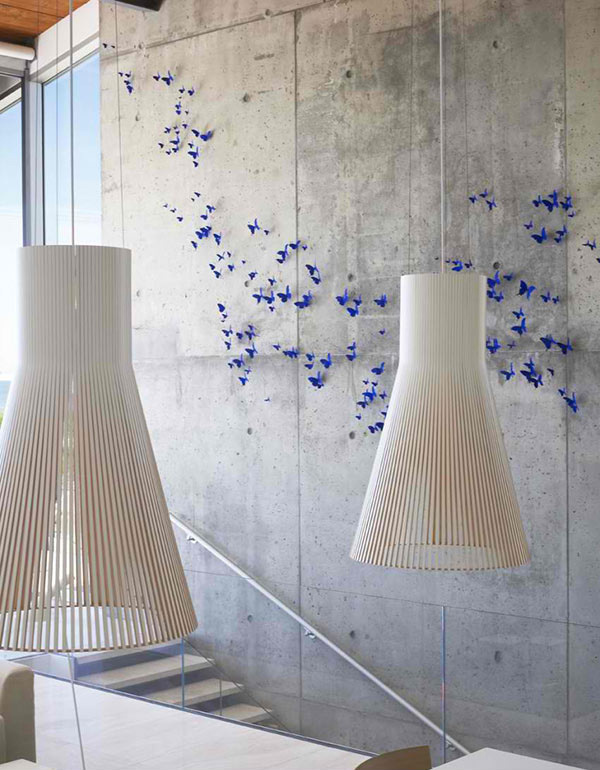 The pendant lights are true charmers too! The red and white rocking chairs are beautiful! These modern pieces look like two swans beside each other. This is what you will find in the ground floor leading to the pool area- a stunning living area with comfy low profile furniture. And this is the pool area. Isn’t it beautiful? It may look simple but we can all sense a different level of beauty from here! 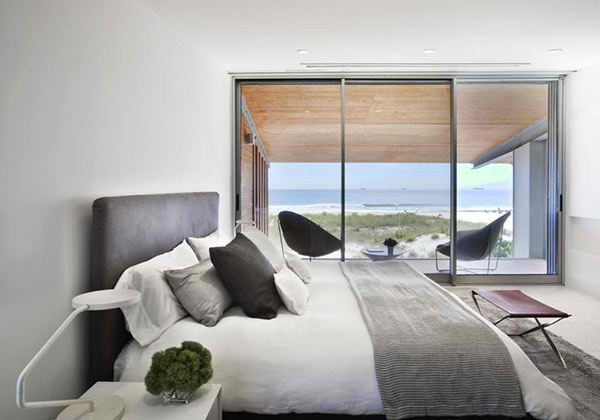 A bedroom with gray tones in it overlooks the Long Beach and the ocean. The bathroom is on the same level as the bedroom and yes, it is well designed too! Since the house is not used all the days of the week, theWest Chin Architects used solar panel on the south facing roof that will put energy back on the grid during the week, when the house is not in use. During the weekends it will supplement the electrical needs of this 5,500 sq. ft. house. This way, it isn’t just beautiful but also sustainable.